Question 1: Welcome Mr. President, and thank you for speaking to Wion. I’d like to begin by asking you about the situation obtaining in Syria today. Now, by all accounts, Mr. President, it is the biggest humanitarian crisis of our time, and hundreds of thousands of people, including innocent people, have been killed in this war, in this conflict. So, how is this campaign of yours against terrorist groups such as the Islamic State progressing? President Assad: Thank you for coming to Syria; and you come at a time when the situation has improved dramatically, let’s say, because the terrorist groups, mainly ISIS and al-Nusra and like-minded groups in Syria who are Wahhabi terrorist extremist groups, are retreating, or let’s say the area under their control has been shrinking. So, the situation on the ground, from a military point of view, is much better than before. But this is not the whole picture; it’s not only about military conflict, it’s about different things, about the ideology that they try to spread in our region, which is the most dangerous challenge that we may face in the near and long term. Second, it’s about the support that those terrorist groups have been gaining from regional countries like Turkey, Qatar, and Saudi Arabia, and European and Western countries like the United States, France, and UK, mainly, which mark a new era in the world where you can use terrorism, any kind of terrorism, to implement a political agenda. This is something more dangerous than any other danger that we may face in our modern world. Question 2: Mr. President, you mentioned the names of some terrorist groups, you mentioned the names of some countries including Saudi Arabia and other countries, but if I were to ask you, Mr. President, who or what do you blame for the crisis in Syria today? President Assad: If I want to be objective, we always say that if you don’t have your own, let’s say, defects in your society, in your country, the external factor would be minimal. So, we always talk about our mistakes or our loopholes or defects, but at the end, we didn’t bring the terrorists, we didn’t support the terrorists, we didn’t support this ideology. Mainly, who started this conflict was Qatar under the supervision and the endorsement of the Western countries, mainly France and UK, at the very beginning, but when you talk about France, and UK, they wouldn’t do something without the permission of the United States. We all know that the real mentor is the United States, but they allow others to play different roles. So, if you want to blame about who supported the terrorists and who started this blood-letting and blood-shedding in Syria, it was the West and Qatar, and later Saudi Arabia, one year later joined the same effort, and of course Turkey, we wouldn’t forget Turkey which was the main player with the terrorists in Syria from the very, very beginning. Question 3: Mr. President, you spoke about how to end this blood-letting. Would you be open for a negotiated political settlement going forward, maybe underwritten by Russia or some other members of the UN Security Council? President Assad: Of course, we have already joined these efforts since Geneva in 2014, something like this, a few years ago, it’s not only about joining that effort; you need a real effort, you need a methodical effort that could produce something in reality that could be fruitful. Till this moment, we haven’t had any real political initiative that could produce something, although Astana has achieved, let’s say, partial results, through the recent de-escalation areas in Syria, which was positive in that regard, but you cannot call it a political solution till this moment. A political solution is when you have all the different aspects of the problem being tackled at the same time. So, we took the initiative in dealing directly with the terrorists in some areas in order to make reconciliation, where they can give up their armaments and we can give them amnesty, and that has worked in a very proper and good way in Syria. Question 4: Mr. President, you mentioned about the United States. Now, we know that you had historical differences, if I can put it that way, with the American administrations, subsequent American administrations, but the US President Donald Trump has just completed his inaugural tour of West Asia, as it were, or the Middle East, as others call it. Is Donald Trump someone you think you can do business with? President Assad: The problem in the United States is about the whole political system, it’s not about one person. Trump’s election has proven again, for us, again and again, that the president is only a performer, he’s not a decision-maker. He’s part of different lobbies and the deep state or the deep regime as we can call it, who implement and dictate on the president what should he be doing, and the proof to what I’m saying is that Trump after he became president, he swallowed most of the promises and the words that he was boasting during his campaign. He made a 180 turn in nearly every promise. So, why? Because the deep state wouldn’t allow him to go in a certain direction. That’s why for me dealing with him as a person, it could be, but can that person deliver? No. In the United States, the president cannot deliver, the whole state, the deep state only is the one who can deliver, and this is the problem. This deep state doesn’t accept partners around the world; they only accept puppets, and they only accept followers, they only accept proxies, that’s what they accept, and we’re not any of these. Question 5: Mr. President, I want to draw your attention to the events of 4th of April, when the world was told about a so-called chemical attack or a chemical incident. Now, in your estimation – and you’ve been asked this question several times before – what is the truth behind the April 4 incident, and who do you think might be behind it? 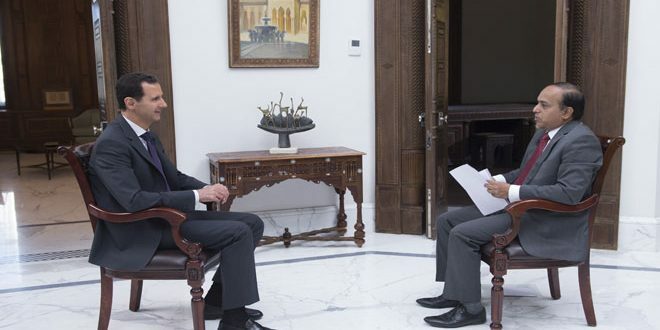 President Assad: You know, every politician can say “no, we don’t do it,” morally or for any other reasons, and the viewers can say “no, no, he’s not honest.” I wouldn’t talk about this in that traditional way. I would say let’s ask the question: would it be logical to be used? If we have it. We don’t have chemical weapons, but if you have it, if you want to use it, why would you use it in that case? One week before that alleged incident, the terrorists were advancing, we didn’t use it. So, why to use it when the army was advancing and the terrorists were retreating? This is first. Second, it was used – as they said, we don’t know if it’s true or not – against civilians in one of the cities. So, if the Syrian Army wanted to use those kinds of weapons, why doesn’t it use it against the terrorists who’ve been in the field, not against the civilians? So, all this story doesn’t have, let’s say, legs to stand on, it’s not realistic, it’s not logical. So, who’s behind it? It was very simply the United States and the Western intelligence with the terrorists. They staged this play just to have a pretext to attack Syria, and that’s what happened a few days later when they attacked our airport, and actually they supported the terrorists, because ISIS launched an attack the same day of the American attacks on our airbase. And they wanted to demonize again, to re-demonize the Syrian state and the Syrian President. So, this is the only headline that could capture the audience and the public opinion around the world. Question 6: Mr. President, also you’ve been asked this question several times before, I’ll ask you one more time for the benefit of viewers who might be watching you from South Asia and around the world: does Syria have chemical weapons today? Have all your chemical weapons inventory been destroyed by the OPCW? Also, would Syria be holding on to some chemical weapons or hiding it? Your thoughts, Mr. President? President Assad: Actually, they announced a few years ago that Syria is devoid of chemical weapons. Even John Kerry announced that Syria is free of any chemical weapons. They wouldn’t have done so if they weren’t sure about this. No, we don’t have, and we don’t have the facilities now, even if we wanted to do so. Question 7: Mr. President, on that note I want to shift your focus away from domestic issues to Syria-India relations, and we know that Syria-India relations have stood the test of time. India in particular has taken a neutral, independent position. It is against foreign intervention of any sort in any domestic crisis around the world. It believes in having a non-violent solution to issues, so what do you make of Prime Minister Narendra Modi of India’s policies, especially India’s policies towards Syria in the recent years? President Assad: We respect a lot the Indian position, because first of all it’s based on the international law, it’s based on the charter of the United Nations, it’s based on the morals of the world, of the human civilizations first, and Indian civilization second, the Indian people’s morals. This is very important, that’s the difference between state and regime: the state bases everything, all its vision, all its policy on the ethics of its own people. So, we respect the Indian position in that regard. Second, as you just mentioned a very important word, it was “independent.” In spite all the pressure, all the Western pressure on every country including India to join the embargo against the Syrian people, India wouldn’t cease its relation with Syria, and some of the investments are still going on in Syria with Indian participation in different sectors because of that independent position. Question 8: Mr. President, both Syria and India happen to be surrounded by hostile forces or hostile neighborhood, and India knows that Syria has supported India on the issue of Jammu and Kashmir, for instance, but that said, terrorism is common to both countries, and we are victims of terrorism as we call it. What are the lessons one could learn, Syria, from the Indian experience of combatting terrorism, extremism, radicalization, and also how can India learn from your experience of combating the Islamic State or Daesh as it’s called here? President Assad: I think our independence came at the same time, in the 40s, in that era, and the geography could be different, the reason why we have been facing terrorism could be different, but at the end terrorism is one, and the ideology that we’ve been facing is the same one, and the most important thing is that the terrorism has been used in India for political reasons, for a political agenda, and Syria is the same. To support terrorist organizations for political agenda, this is something very dangerous. It’s beyond only India and beyond Syria. If you look at the map of the world now, if you look at Libya, at Yemen, at what happened recently in Egypt, in France, and recently in UK, it tells you that terrorism has no borders, so what we have to do is not only to learn from our experience, if you talk about Syria and India, it could be very similar, we could learn a lot from each other, but it’s more than that; we need to have an international coalition against terrorism, a genuine one, to work against terrorism, to learn from each other, and to support each other in the fight against terrorism. As you mentioned, we can cooperate, but cooperation is not only intelligence, it’s about the ideology, it’s about the politics that’s been supporting these terrorists or this terrorism, how can we work together politically to prevent terrorism from spreading and prevailing in the world. Question 9: Mr. President, when we talk about terrorism and its ideology, one can’t but talk about the Wahhabi or the influx or influence of Wahhabism on countries around the world, especially in West Asia. Now, when you talk specifically about countries such as Saudi Arabia, some commentators say that while Saudi Arabia successfully deflected criticism from its own actions, it re-directs the criticism to countries such as Iran in the neighborhood. So, how do you explain this, or the role of countries such as Saudi Arabia in the region? President Assad: To be precise, the word “deflect” is not precise for one reason: because when the Saud family created this kingdom, they created it in cooperation and in coordination with the Wahhabi institution, so it’s one institution. The Wahhabi institution, the extremism or the extremists in Saudi Arabia defend the state because it’s their state, it’s their own state, so it’s one. You cannot talk about terrorism and Saud family as two entities, I have to be very frank with you. That’s why they didn’t deflect; they exported the terrorism or the extremism or the Wahhabi ideology to the rest of the world. Nearly every “madrasa” in Asia, in Europe, every mosque, has been supported financially and ideologically through books and through every other means by the Wahhabi institution. That’s why I wouldn’t say, no, they didn’t deflect, they exported. Question 10: And Mr. President, talking about the contemporary situation obtaining in Syria today, do you see any role at all for India in the reconstruction in Syria? Also, any possible role which you may see or view India is playing in the peace process, also? President Assad: Definitely, definitely. First of all, if you want to talk about the political part, the most important factor for any player to play any role in such a complicated conflict is to have credibility, and India through the history has always been credible. Through the different parties that took power in India, we never noted that there’s any fluctuation in their policy because it’s based on morals and ethics as I said. So, this credibility is a very important factor for India to play a role, not necessarily within Syria, because the Syrian conflict is not only Syrian; the main factors are regional and international, and the most important part of this that how can we protect international law. So India as a main country on the political arena today has to do its utmost in order to protect the international law and the Charter of the United Nations through its relations. India has relations with every country in this world. So, with their effort, the effort of their officials and the government, they can help in that regard. If you want to talk about the reconstruction, as you know when you have war in any country that destroys much of the infrastructure, the most profitable sector would be the rebuilding, and India is welcome to play an economic role in the reconstruction of Syria, something that we already started. We started this project in Damascus, and now we are expanding that project in most of the cities in Syria, of course after the liberation from ISIS and al-Nusra and those terrorist groups. Of course we welcome any Indian company. 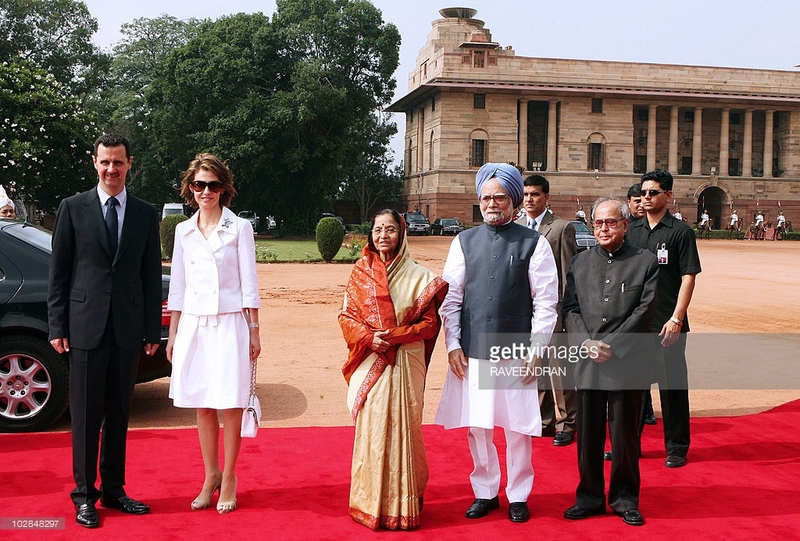 Question 11: Mr. President, you visited India in 2008, and on that occasion you also visited the Taj Mahal in Agra. When do you plan to visit India next? Would you like to make India your first destination… you seldom travel abroad, so would you like to visit India soon? 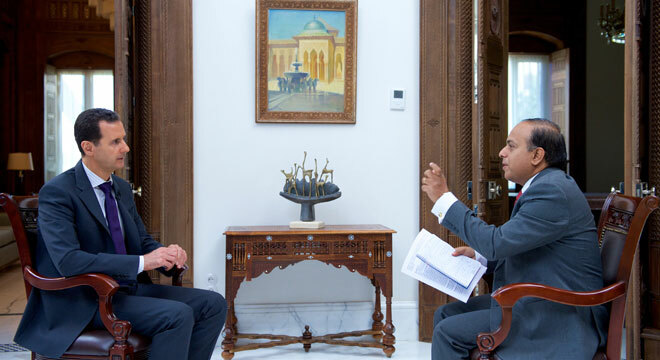 President Assad: Of course, definitely, definitely, and the scope of the relation between Syria and India, I would describe it as ample scope, and that was my plan in 2008, and this relation was moving upward. Because of the war, things have changed in a different way, but of course after this war India will be one of the first countries to visit, not because of the scope of the relation, but actually because we have to be faithful or loyal to every country that was objective and moral in its position toward the war in Syria. Question 12: And talking specifically about the ongoing campaign against the Islamic State or Daesh, how many more months would you give the Daesh before it’s pushed out of your sovereign territory? President Assad: If you want to talk about our war, regardless of the influence of the external wars, ISIS is not very strong, it would take a few months, even with al-Nusra. Now, the problem is that ISIS has been supported by the United States. The United States attacked our army that’s been fighting ISIS three times during the last six months or so, and every time they attacked our forces in that area, ISIS attacked our forces at the same time and took over that area. So, the realistic answer is: that depends on how much international support ISIS will get. That’s my answer. Question 13: Mr. President, I now want to talk a bit about President Assad, the man, the family man. You’ve been in power for now 17 years. How has this current phase of crisis affected you and your family, your children? What’s the kind of conversation that you might be having, or they might be having with you about the situation that they see around them today? Journalist: And what would you tell them? President Assad: I tell the truth. You have to be very transparent and very realistic, because in spite of all the bad aspects of the war – as you say every cloud has a silver lining – it’s a lesson, it’s a lesson they should learn, because maybe our generation and the previous generation didn’t learn from the mistakes, that’s why you have the war. They should learn from that lesson in order to protect our country in the future when they are grown up. Question 14: Mr. President, you’ve been in power since the year 2000, it’s been 17 years now, and many world leaders have come and gone; President Obama in the US, President Sarkozy, President Hollande in France, and many countries around the world, but you’ve survived, you’ve stayed there, you’ve stayed the course. What’s your secret of success? 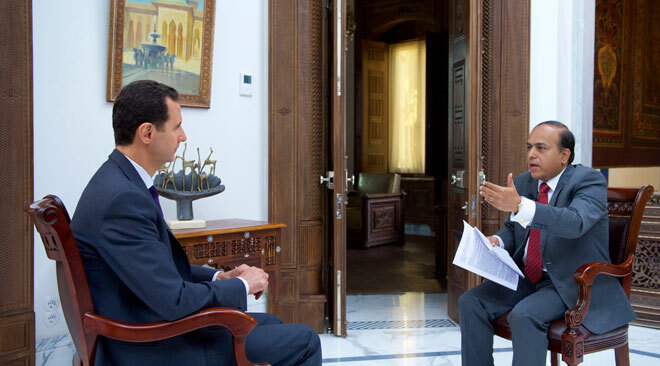 President Assad: I don’t have a secret; it’s the Syrian secret, it’s the public support. If you have public support, you can withstand any storm, that’s a very simple fact. If you don’t, you would have withstood for a few weeks or a few months, not few years, you cannot. I don’t think the battle is the president’s battle as the Western media tries to portray. It’s not my battle, I’m not fighting for my position, I don’t care about that position; I only care about the public support. So, for us as Syrians, it’s a national war, everybody is fighting for his country, not for the president. This is the secret, maybe, that the West didn’t discover, because they were too superficial to analyze the situation in Syria. So, actually, it’s not a secret; it’s something they didn’t see, but it’s not a secret. Question 15: Mr. President, do you ever tend to take a chance to look in the rear view mirror, as it were if you would go back in time, would you like to do things differently maybe? President Assad: If you talk about daily things, you always have different vantage points to look at things, so you can say I would have done it in a different way, but if you want to talk about the main strategy, headlines, like fighting terrorism, of course we’re going to fight terrorism. This is constitution, this is the law, and this is our duty as government to defend the people. So, we wouldn’t discuss this. To have dialogue with everyone, including the terrorists, of course, it’s a strategy that we think that has produced positive effects. How can we change or fine-tune this strategy, this is another issue. You can fine-tune it, but as a headline, of course, I would say that was correct. To open up even with another country like the Western countries that allegedly wanted to help Syria, it was correct, but it didn’t produce. I think the only mistake that we made is when we believed that the West has values; this is one of the mistakes that we committed in the past, and we thought some countries like Saudi Arabia could have values, but the only value that they have is the Wahhabi value. Question 16: Mr. President, there’s a lot of narrative about the Western media perceptions about you, personally speaking. Now, we’ve seen the humanitarian issue or angle from the pictures and videos of children who have been sufferers of this conflict, we saw the case of Alan Kurdi who was washed ashore dead in Turkey, Omran Daqnish, the boy who was sitting in an ambulance, even Bana al-Abed whose tweets went viral. Don’t you sometimes think that, you know, this thing has gone on for far too long, it’s gone too far, and maybe everybody, and I mean everybody, should step back from the brink? President Assad: The West, you mean, mainly the Western? No, they cannot, because if they do any U-turn or any turn, their public opinion will tell them “you were lying, you’ve been talking about this bad person and this bad government and the killing for seven years, now you want to tell us the truth?” They cannot tell the truth. So, they have to continue till the end with their lies, till these lies will be debunked by their public opinion. They cannot. Question 17: And Mr. President, have you ever considered a life outside Syria, maybe stepping down, or life outside Syria? President Assad: Stepping down, as president, because you came through elections, will be through elections, or when you notice that the Syrian people will not support you, because if they don’t support you, you cannot achieve, you cannot produce. This is where you have to leave. Because the situation is not like that, and you’re in the middle of the storm, Syria is in the middle of the storm, I cannot say I’m going to give up and leave. This is going to be very selfish and very un-patriotic, let’s say, if we can call it this way. No, in the middle of a storm, you have to do your job as president till the people tell you “go, leave, you cannot help your country.” This is where you have to leave. So, this is regarding leaving Syria, but for me personally, to leave Syria, no, it’s not an option for me. Since I was young, I was, how to say, brought up as a person who can only live in his country, not any other country. Question 18: Mr. President, the last 17 years you’ve seen one crisis after another, starting from 2003 Iraq war till now. 17 years is a long time, do you at all make time to relax, maybe to watch a movie, hear some music, spend time with family and kids? President Assad: The family is a duty; it’s not relaxation, it’s not entertainment, it’s a duty. You have to find time for your family like you have to find time for everything. If you don’t feel your family, you cannot feel the other families that have been suffering in your country. So, of course, but for the entertainment, it’s not only a matter of time, it’s a matter of feeling. Now, you cannot feel the entertainment while everybody surrounding you is suffering from terrorism; it’s a matter of psychology. So, it’s not my interest at this time. I think most of the families in Syria, they don’t have this interest. The interest now is the daily survival for many families. Question 19: And Mr. President, in conclusion just a couple of more questions. 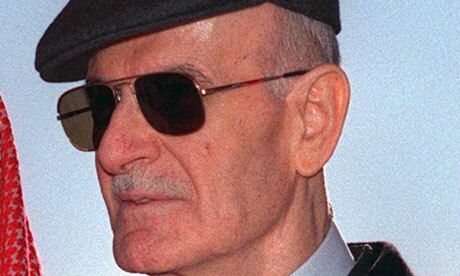 In your moments when you’re alone with yourself, do you at all think how would President Hafez would have dealt with some situation if he were here today, do you miss his advice maybe? 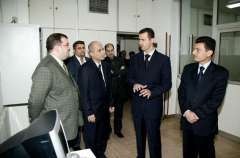 President Assad: No, because it’s not the first time for us to face the terrorism; we’ve been facing terrorism before Hafez al-Assad, before President al-Assad, in the 50s when the Muslim Brotherhood came to Syria, since that time, the conflicts in Syria started in a similar way, but on a different scale. So, the principle of the conflict is the same; terrorism is terrorism, extremism is extremism, no matter what names you use for the organizations. The methodology of all those terrorists are the same, that’s what I want to say. 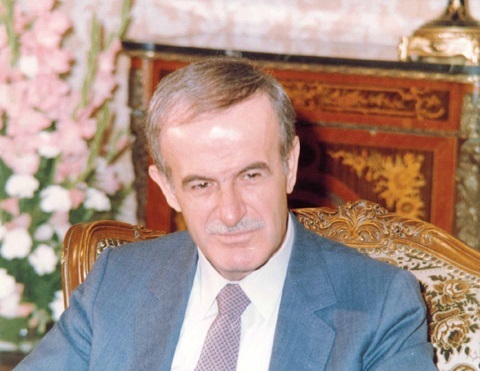 So, President Hafez al-Assad fought those terrorists in the 70s and the 80s and we have to fight them today, and if we face them 50 years later with another generation, we have to fight them. So, I think this is one response and one methodology. Again, it’s about the details. The details could be different not between two eras and two presidents, it could be different from day to day, because when you have such a war, you can have things that have been fluctuating or changing in a very fast pace. Question 20: Mr. President, in conclusion, very few people know that you studied medicine, you are an ophthalmologist, do you miss your London days, I mean, do feel like going back in time, as it were? President Assad: But actually, I was an ophthalmologist in Syria before I was in London. I worked three years and a half in Syria, and then I went to London for about two years. So, if you want to talk about missing the job, of course, it’s something you always feel passionate toward, you don’t have to say that you miss it, that you don’t like this job. Today, you are on a bigger scale when you help the Syrian people, this is something you should love. If you don’t love it, if you don’t have this passion toward it, you cannot succeed. Of course, I have a very strong passion for this, but the scientific field in general is my second passion since I was young, not only ophthalmology, all the science sectors in general. So, you always feel this passion and you feel that you want to know what’s the update, what are the new trends in that field. Question 21: Mr. President, is the worst behind you? President Assad: I hope so, I hope. I mean, because things now are moving in the right direction which is a better direction, because we are defeating the terrorists, unless the West and other countries and their allies, their puppets, supported those extremists in a very, how to say, massive way, I’m sure the worst is behind us. Question 22: At the end, very quickly Mr. President, in very briefly, what would be your message to the people watching this, especially in India and South Asia and around the world, your message to them? President Assad: I think during the last few decades, mainly after Bush came to power in the United States, the West tried to promote its society, its political system, its behavior as the minaret that the world should follow socially and politically and in every other aspect. I think India, the Indian people are the one that could be that minaret because of the diversity that you have, because of the civilization that’s deeply rooted in the history, and because of the morals that you base your society and your politics on, because of the real democracy that India showed to the world, because of many things, I think India is the one who are ready to lead that direction if they want to set an example for any other country to follow. This is my most important message, because we know what’s the meaning of diversity because we are a diverse country but on a smaller scale. Journalist: On that note, Mr. President, I want to thank you, and it’s a pleasure talking to you. 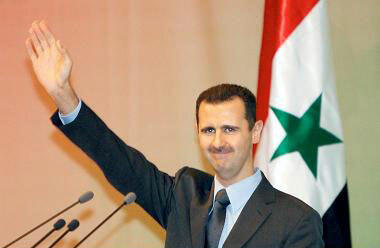 President Assad: Thank you. Thank you for coming to Syria.